This Chocolate Chip Vegan Banana Bread is so easy to make in just one bowl and it’s absolutely delicious! 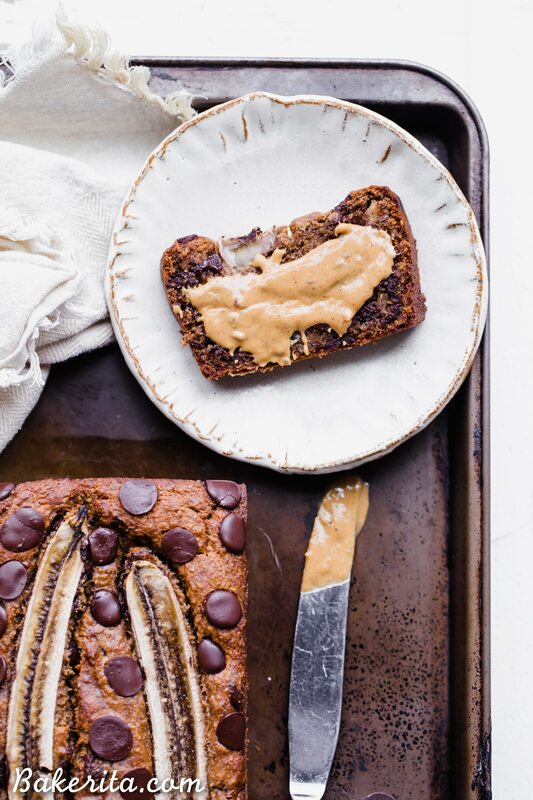 This vegan banana bread is also gluten-free and refined sugar-free – it makes the perfect easy breakfast, snack, or dessert. This post is sponsored by Bob’s Red Mill. 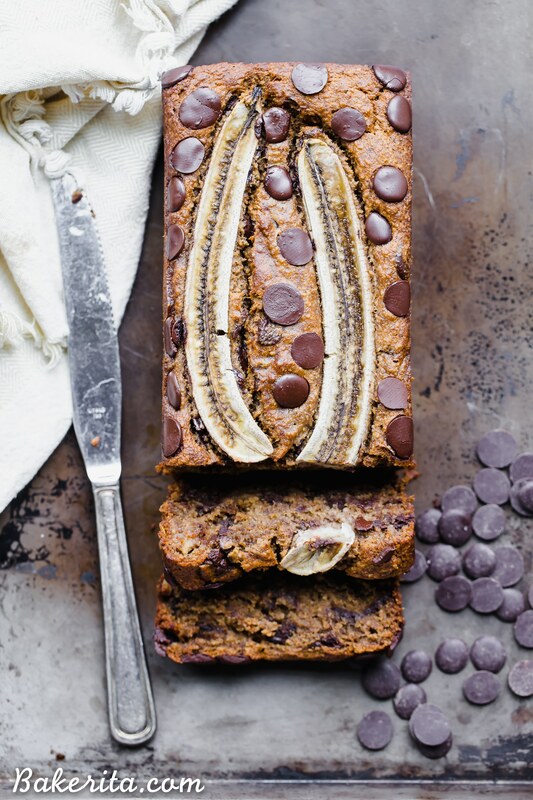 I’ve been dreaming of a vegan banana bread for ages. But, I could never seem to get the recipe quite right. I’d test, use up all of my ripe bananas, and give up until the next time I had a bunch of extra ripe bananas on the counter. That makes for a relatively slooooww testing process. But finally, last week, I HAD TO HAVE IT. So I bought a ridiculous amount of bananas and impatiently waited for them to get ripe enough. The first test was good, but it could be better. It tasted good, but it was a little dense and a little gummy. So I tested three more times, and thought I got sooo close with the third try. But, I gave it one more try and I’m glad I did because helloooo banana bread perfection! 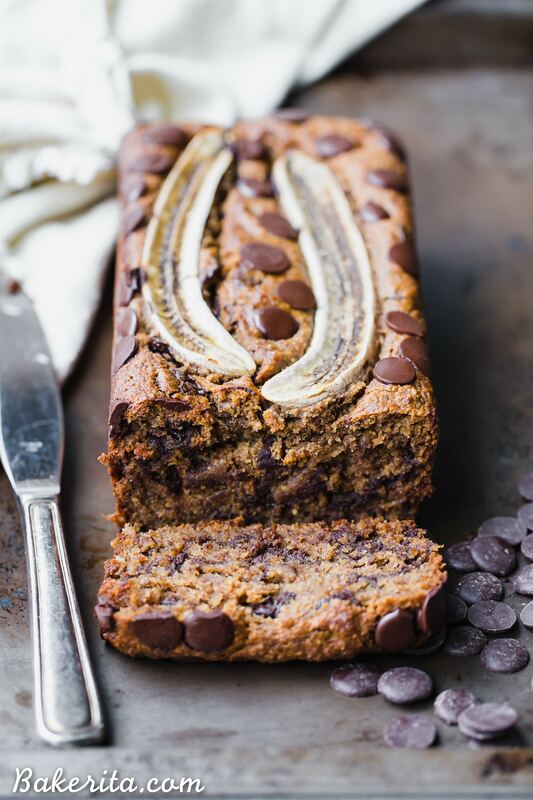 This banana bread was up against some tough competition – my paleo chocolate chip banana bread, and I’d say it’s a solid competitor. It’s nice and fluffy, full of the flavors of banana, cinnamon, and chocolate, super filling, and of course – absolutely delicious. The recipe is pretty quick + simple to make too, because who wants to spend a whole bunch of time making banana bread? No one, that’s who. It takes long enough to bake, no need to add any extra steps to make it take LONGER to get to your hungry mouth. 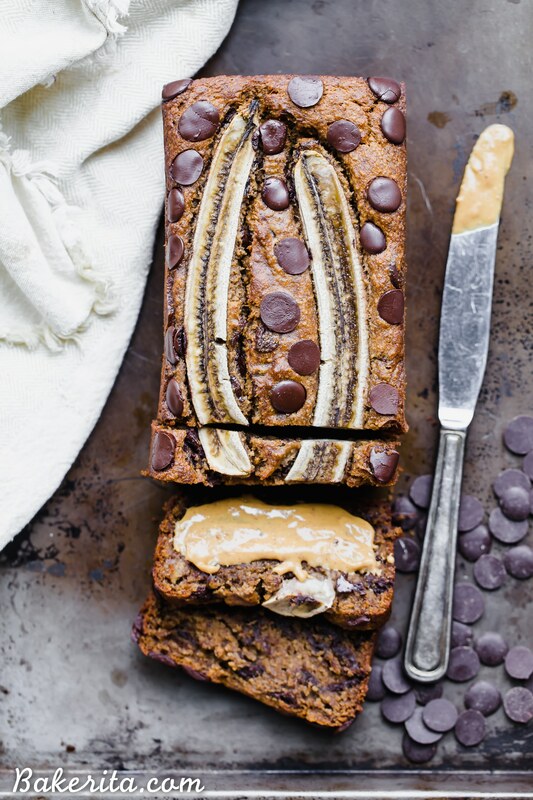 Vegan Chocolate Chip Banana Bread, meet mouth. The recipe uses a little nut butter to help keep things super soft – I used peanut butter, but any nut or seed butter will work. You can’t really taste it so it doesn’t matter too much! It’s also sweetened just 1/3 cup of coconut sugar – if your bananas are SUPER ripe and sweet, you can reduce this amount to your liking. It uses a combo of oat and almond flour. I found half of each creates the best texture that’s not too gummy or dense. Both are from my favorite flour brand, Bob’s Red Mill. I was actually out of oat flour by the time I got to this loaf though. Thankfully, it’s super easy to make your own. To make your own oat flour, put some BRM’s rolled oats in the Vitamix (or another blender or food processor) and blend until it’s flour. So easy in a pinch! Bob’s also sells premade oat flour and either will work wonders here. I also like to dump a whole bunch of cinnamon into my banana bread. It’s a personal preference, so feel free to jack up the amount in the recipe, like I tend to do, or use less if your tastes prefer. 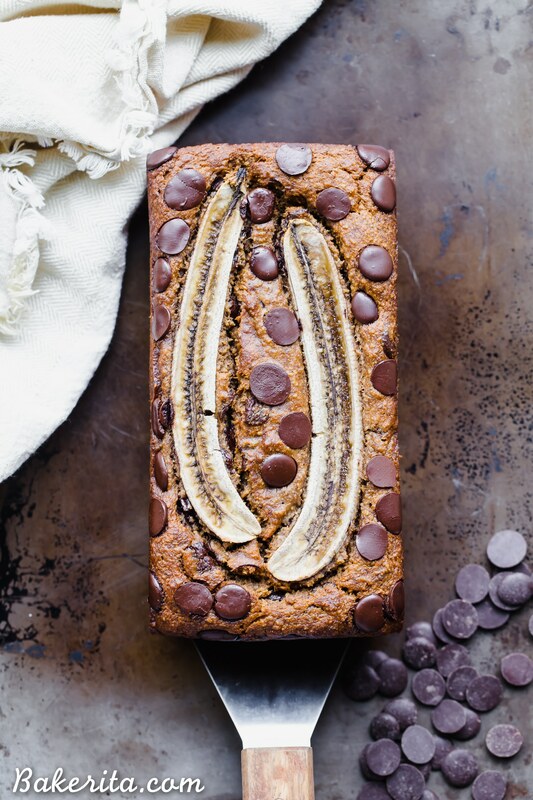 I hope you’ll love this banana bread as much as I do! It’s pretty irresistible if I do say so myself. My dinner last night consisted of a slice slathered in peanut butter and I regret nothing. Hope you enjoy! This Chocolate Chip Vegan Banana Bread is so easy to make in just one bowl and it's absolutely delicious! 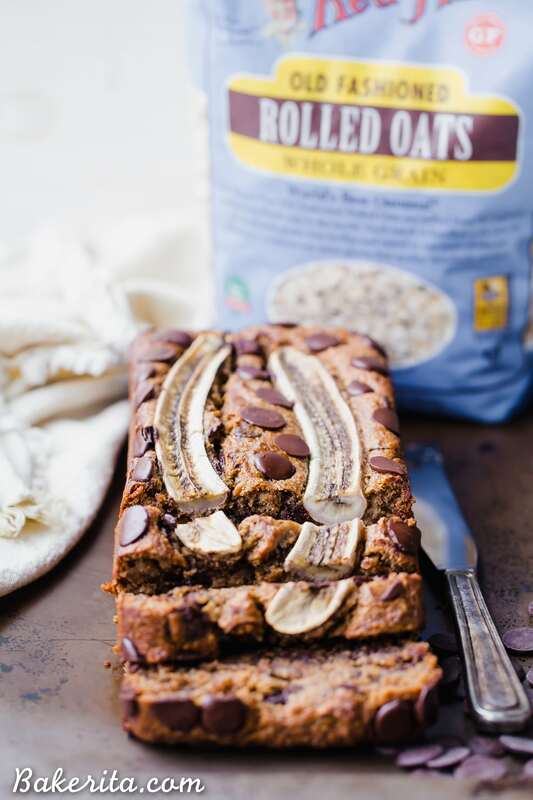 This vegan banana bread is also gluten-free and refined sugar-free - it makes the perfect easy breakfast, snack, or dessert. 1 cup (120g) gluten-free oat flour I made my own - see Notes for details! Preheat oven to 350F. Grease a 8.5” x 4.5" loaf pan (you can also use a 9x5” pan) with coconut oil and/or line with parchment paper. Place bananas in a large mixing bowl. Use a potato masher or fork to mash them well. Add almond milk, coconut sugar, nut butter, coconut oil, vanilla extract, and flax meal, stirring to combine. Add oat flour, almond flour, baking soda, baking powder, salt, and cinnamon. Stir until combined. Fold in chocolate chunks. Pour into loaf pan. Add a sliced banana and/or more chocolate chips on top. Bake for 50 minutes to an hour, or until a knife comes out clean. If your loaf looks like it's getting too brown, tent with tin foil on top after 50 minutes. If you’re using a 9x5” pan, check on the banana bread after 40-45 minutes. I made my own oat flour for this recipe from Bob's Red Mill GF Rolled Oats. To make, put the oats into a blender or food processor and process for about a minute, until it's flour. Thanks so much for the love Brittany!! :) Hope you love it! What would you substitute for the oil? 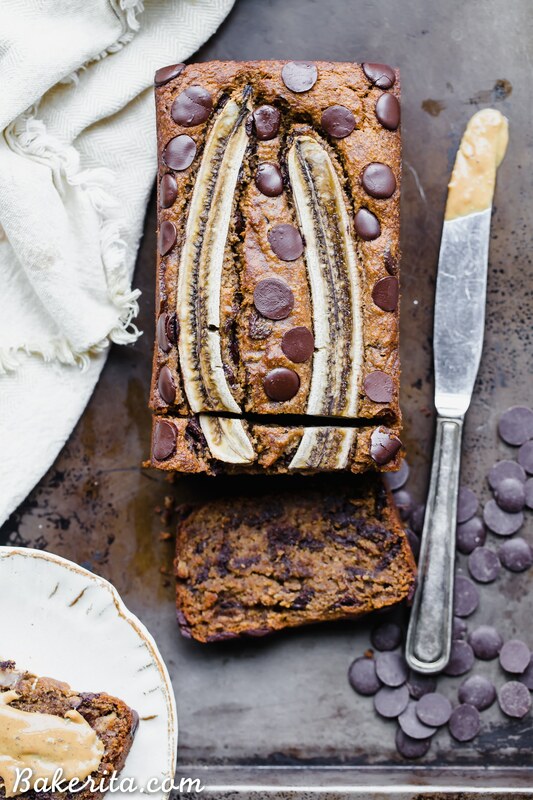 Have some very ripe bananas and really want to make this!!! Thanks! Hi Deb, I only tested as is, so I can’t make any guarantees when you start making substitutions. You can try subbing with applesauce or more banana, though. Hope it turns out well! I use applesauce in place of oil all the time, only thing it doesn’t Work in is waffles, they break apart in waffle iron. I usually add 1/4 cup ground flax seed, 1/4 ground hemp seed and oat bran in place of some of the flour. Thanks for sharing your tips, Shirley! Hi, can you use another flour that is not oatmeal? because here in Argentina where I am living now they don´t have gluten free oatmeal and the regular does not do me good. Hi Maria, I’ve only tested this recipe as written so I can’t guarantee any changes you make will work well. You can feel free to experiment, maybe with all almond flour or subbing in another GF flour for the oat flour, and let me know if your substitutions work! Sorry, I can’t be more help! Made these into healthy ‘cupcakes’ and topped them with cacao avocado icing. Such a hit! Thanks for recipes I feel great about eating! Love that idea so very much! So glad you’re enjoying them, Tanya :) thanks for sharing! Hi! Amazing recipe, can’t wait to try it but I don’t have flax meal :( can I substitute it or don’t use at all? Thanks Julia! You could use ground chia seeds if you have them, or just try leaving them out entirely. I’d love to hear your feedback if you try either of those ways :) Enjoy! I have some peanut butter that has flax and chia mixed into it (Trader Joes brand) that I was hoping to use. Do you think I should lessen the amount of flax meal the recipe calls for at all if I use it? Hi CC, that will be fine to use but no, I would keep everything the same in terms of flax amounts. Enjoy! This looks delicious! I don’t have almond flour on had, do you think regular whole wheat flour would work in this recipe? Hi Cheryl, I haven’t baked with whole wheat flour in a while and it wasn’t tested that way so I’m not entirely positive, but it should work! Is it really gluten free if it contains oat flour? Just wondering if i could give this that is alergic to gluten. Hi Ana! I should have specified gluten-free oat flour, because while oats are inherently gluten-free, many times they’re processed in the same facilities of wheat, which can cause cross-contamination. I’ve updated the post to specify that. If the oat flour you used is GF, it’s fine to share with those with gluten allergies. Hi Rachel, it would affect the texture, making it a little denser, but should bake up just fine. I just made this and omg it’s so good. It’s taking everything in me not to eat the whole thing. I tried eating a slice after letting it cool a bit right out of the oven and it was a little crumbly, so I put it in the fridge overnight and it was moist and perfect in the morning! I also only used 1/4 cup sugar and still found it was sweet enough but chocolate chunks are a must! Thank you! I have made it a lot of times. I have tried oat flour, spelt flour, and gluten free flour mix (to sub for oat flour) and every time it came out delicious ! I appreciate how clean and simple this recipe is and best of all it’s so delicious even though it is vegan and refined sugar free. Defiantly a recipe I will be heading back to countless more times.